We’re always on the lookout for fun ways to practice math facts! Fact automaticity is an important area of focus in the early grades, and although instruction doesn't center around facts in upper grades, as students advance to more complex mathematical concepts, fact knowledge remains critical to math success. After all, a student can’t devote all of his mental resources to learning new algebraic concepts if he’s still struggling with basic multiplication. Here are some great ideas, one we developed ourselves and two websites we recently discovered, that are perfect for fun practice! Got a stack of math fact flashcards to get through? Make drills fun with tic-tac-toe! To play, draw a standard tic-tac-toe board. Each player should draw a flashcard; the player whose sum/difference/product/quotient is larger goes first. 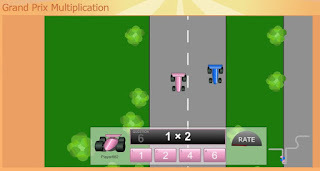 The first player draws a new flashcard and calculates the answer. If it is correct, she puts an X or an O in a square on the board. If it is incorrect, she loses a turn. Next, the second player takes a card, solves it, and makes his move. 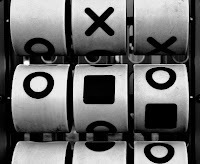 Just like in regular tic-tac-toe, the first to get three in a row wins. If a parent is playing this game with a child, mom or dad may want to make “mistakes” now and then to give the child additional fact practice. The MangaHigh website offers some of the most engaging math games we’ve come across for practicing basic facts, along with geometric concepts, number line principles, factoring, order of operations, and more. The games are quite ingenious; players recall facts as quickly as possible to whack piñatas before they fall to the ground, add scoops of ice cream to ever-growing sundaes, or tunnel their way out of an Egyptian pyramid before they’re caught by an evil dog demon. Students can play limited versions of the games for free, or their teachers or parents can choose to register for either a free account, or an extended membership for a minimal fee. It will be hard to tear your child away from Arcademic Skill Builders and its simple, yet thoroughly enjoyable academic games. 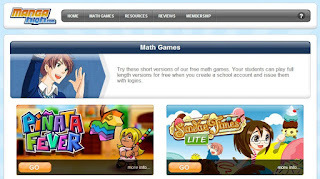 Most games on the site are math-based, offering practice not only with basic facts but with money, time, and fractions, ratios, and decimals as well. The site allows students to simply play against the computer or to play against other contenders from around the web. The site features a smattering of games to practice other skills (spelling, word relationships, geography, and typing) as well. All games are free. For more ideas, please read some of our past posts with ideas for in-person and online math games; recommendations for math apps; and learning facts through song and through everyday activities.